Luminescence spectra and relaxation curves of nonequilibrium photoconductivity of AgIn5S8 single crystals under the action of Nd:YAG-laser radiation are experimentally investigated. It is shown that depending on the nature of excitation (one- or two-photon excitation), the emission lines of a free exciton with its phonon repetition and the emission caused by structural defects are observed in the luminescence spectrum. 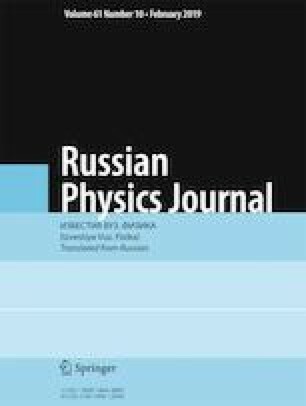 Investigation of the nonequilibrium photoconductivity relaxation curves shows the presence of two recombination channels with times τ ~ 2.7·10–7 s and ~2·10–6 s.
Translated from Izvestiya Vysshikh Uchebnykh Zavedenii, Fizika, No. 11, pp. 99–103, November, 2018.